Find files by the number of characters. This software offers a solution to users who want to find files by their length. 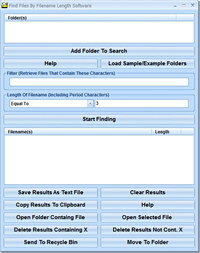 The user adds folder/s to be processed and can enter a string of characters that required files must contain. Files can be filtered following various criteria based on the length of the filename. The results are displayed in a list and can be saved as a text file or copied to the clipboard for pasting. There are buttons to open the folder containing a file in the list, to open a selected file or to clear results containing or not containing user specified text or characters. Find Files By Filename Length Software is an utility that works under windows xp, windows vista, . Estimated download time for Find Files By Filename Length Software on a common adsl connection is less than a minute. 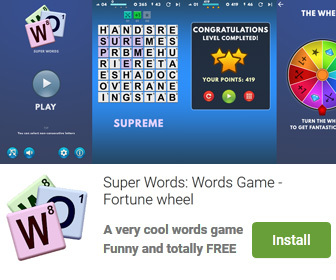 Version 7.0 was released three thousand one hundred eighteen days ago by Sobolsoft. Click the green download button to download it now.